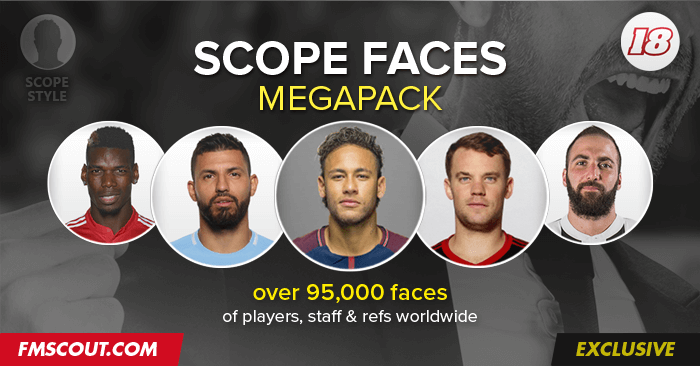 Our scope style facepack includes over 109,300 faces of players, staff and referees for all playable leagues on Football Manager 2018. It’s a sleek and modern circular portrait style in standard size of 180×180 pixels. It is intended for use with FM 2018, but it will work with all versions of the game from FM09 onward. This megapack was made possible in association with the amazing people who produce the DF11 facepacks. THANKS to necjeff for granting his permission to use their top notch collection as base for this megapack. Scope style is originally created by fmscout.com and its production started in February 2012. The Scope faces 2018 collection has been repacked as one megapack and first became available on November 7th, 2017.